Inventory We are a resale marketplace, not a box office or venue. Ticket prices may exceed face value. This site is not owned by Xcel Energy Center . 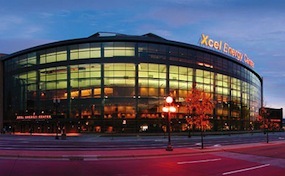 Xcel Energy Center (The X) is a multi-purpose arena, located in Saint Paul, Minnesota, sponsored by Xcel Energy. The arena has four spectator levels: one suite level and three general seating levels named the 100 level, the club level and the 200 level. Its official capacity is 18,064. It is owned by the city of Saint Paul and operated by Minnesota Sports and Entertainment. Prior to its opening, the arena installed an integrated scoring, video, information and advertising display system from Daktronics, based in Brookings, South Dakota. The system includes a large LED centerhung scoreboard with multiple displays, nearly 1,100 feet of ribbon display technology mounted on the fascia and large video displays outside the facility. CenterStPaul.com is a privately held company that specializes in the sale of tickets in the secondary market. We are not affiliated with any official supplier or box office. To purchase tickets to any Xcel Energy Center in St Paul events simply call our operators at anytime or click on the event you wish to attend.